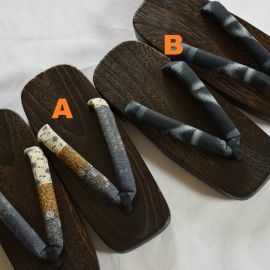 Yaki kiri geta /Wooden Clogs for Men - Geta wooden "Kiri (paulownia)." 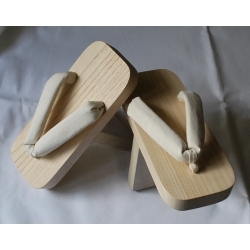 M:25cm (7 - 8.5 inches) L: 27cm (9 - 10.5 inches) Geta are Japanese summer footwear wood Kiri, very light, very soft touch.The skin does not stick this wood, we walk with the 1st and 2nd toe motion gives balance to the body. Ippon ba Geta Size: 26cm (8 - 9.5 inches) Height: 14,5cm Made of KIRI wood IPPON BA GETA is a shoe to improve the balance of the body.